It seems surreal to me to have experienced a competition along-side some of the best triathletes in the world. 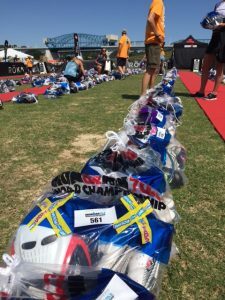 What an honor it was to participate in the Ironman 70.3 World Championships in Tennessee this past Saturday. 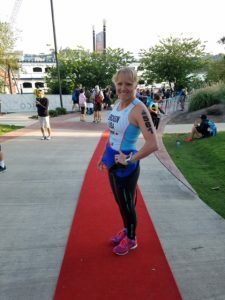 It was a difficult race and I was thrilled to be able to check off another state towards my 50 states goal (Read More:Journey to Race in All 50 States). 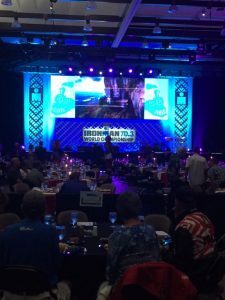 I arrived a few days early allowing me to attend the welcome banquet and have a day to put my bike back together, check-in and get acquainted with the race venue. Tennessee is a beautiful state and the humidity breeds ample foliage. The winding roads were surrounded by trees and greenery and I was excited to know that these would be the roads we would be riding and running on! I love nature! My body was a little stiff and tired from the flight and travel but they managed to loosen up on a run. 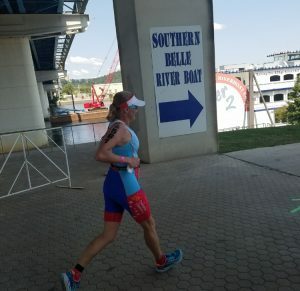 I had some physical limitations this year that have dampened my training efforts but overall my body felt pretty good, all things considered, and I was excited to be there. Next I assembled my bike to find a mechanical problem that I remedied (or did the best I could, not being a bike mechanic). Then it was off to the grocery store for food. I always like to make my own stuff as much as I can so I can eat foods my body is used to. I also needed to pick up some Co2 cartridges for emergency tire changes since they are not allowed on the plane. Then I checked in and picked up my packet and began assembling my bags and getting organized. I always feel so much better when everything is ready. 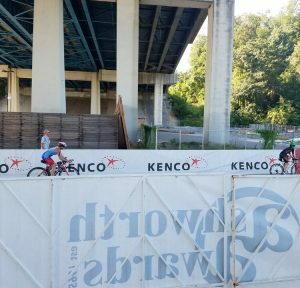 This was a “clean transition” which means nothing more than bikes where allowed in the transition area. The bikes were packed tight with little space around them. 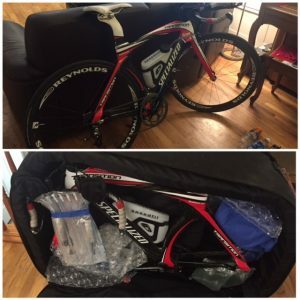 Bags would be used for the ride and run and to be dropped off along with the bike Friday night before the race. This means I had to have everything ready in advance and as the race progresses each athlete picks up their bag, goes through a changing area and then moves to the next discipline. It would add a little bit of time to my overall time but everyone had to do it so I became familiar with all of that before dinner. The Welcome Banquet was spectacular gathering nearly 4,000 participants from all over the world (91 countries) who had qualified for this event in one big room. There was live music and a nice southern dinner with many choices including; pulled pork, chicken, slaw, green beans, corn muffins, green salad, fruit, chocolate brownies and pecan pie. We listened to many speakers welcome us with encouraging words. The highlight for me was when they introduced the youngest (18 years) and oldest athletes. The oldest man was 86! 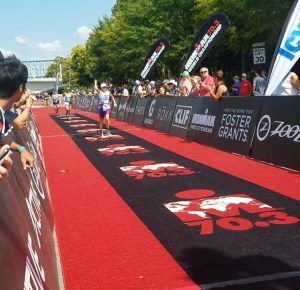 His finish would mark the oldest man to have ever completed the 70.3 WC event. So cool! 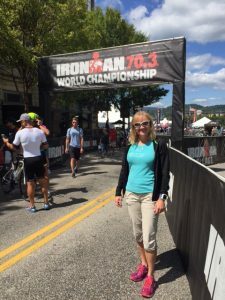 What an inspiration and testament to triathlon being a life-long sport. Race morning the transition was packed with excited athletes chattering about previous race experiences; the nervous energy was nearly palatable. 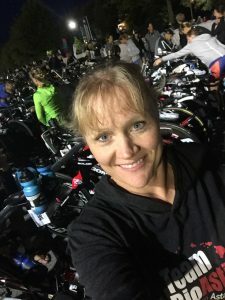 I quickly double checked my bike and set up my nutrition then re-acquainted myself with all the transition ins-and-outs. Soon the women pro’s started. It was fun to see them run through their transition and cheer for them. Then finally it was time for me to head to the swim start. After waiting for what seemed like an eternity we were taken down the corrals to the swim dock (nearly one hour and 40 minutes after the first women were in the water). Then we were off, as soon as I jumped in I could feel the current working against me. It was a difficult swim heading up-river which increased my anxiety but I tried to stay calm and focused. It seemed to take forever to get to each sight buoy and the sun was in my eyes. Finally it was over and a quick glance at my watch confirming my extremely slow swim time; certainly not a good representation of my ability however I quickly put it behind me and focused on the task at hand; there was no use dwelling on it. It is what it is! 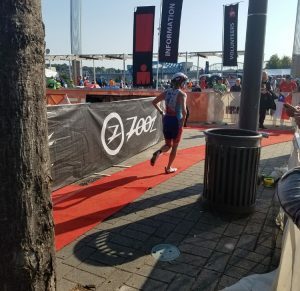 I moved through transition smoothly grabbing my bike bag and switching to cycling gear; I stuffed my wetsuit in the bag and handed it to a volunteer and darted for transition. Sadly my bike was situated on the far side so there was a long run with my bike to the other side of the large transition area then I would finally be able to get on my bike. I kept moving and mounted quickly determined to make up some ground on the ride. I knew I could cycle strong. There was only a short distance before the long Lookout Mountain climb so I tried to get some nutrition in as soon as I could. I swallowed some river water but it didn’t seem to have the effect saltwater has on me so I was OK. The climb seemed to come with no hesitation and soon I was spinning in my easiest gear and watching my heart rate climb. I tried to keep it in check and passed many women who were struggling and some who decided to walk their bike. It was a long leg-numbing climb similar to Snow Canyon in Utah with just some more twists and turns. After the main climb the route continued to be a series of inclines and descents with many turns, and I did drop my chain once. It seemed I spent much of my time in either the hardest gear descending quick then back into the easiest gear to climb so my legs were being put to the test. The route also teased with many false flats and a head wind the last 45 minutes. Being the last wave of ladies in the water the women were spread out so it was difficult for me to really get into race mode since there were so few women around me and large gaps between racers. I worked on catching up to anyone I could see in the distance. A few times I was disappointed to catch a man doing a warm up ride (the men were competing the next day). Honestly, the ride was a little lonely with a few riders dotting the road. 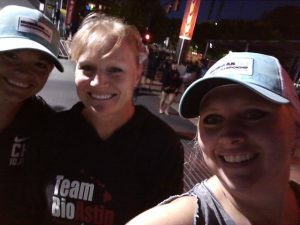 It was a welcome sight to see my “support crew” cheering for me at the half way mark. That really lifted my spirits. I tried to stay focused and ride strong getting all my planned nutrition in. 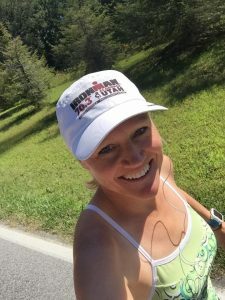 It was not an easy course and to compound the problem my quads and back muscles were starting to spasm and I was getting odd pains in my hips. My muscles didn’t seem to be functioning properly. This was unusual. I later found out that my bike saddle had dropped over 1/2 inch over the course of 56 miles due to a problem with my saddle stem bolt/wedge system that keeps it in place. That explains all the odd pains I was having! 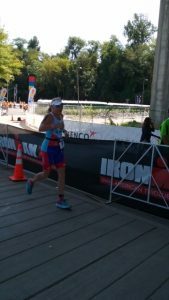 My legs felt different but I pushed forward and was pleased to reach T2 without getting a flat tire. The temperatures where not too bad but the humidity made it feel hotter than it was. I looked forward to cheers from my friend and sister who had come to see me race. It was such a boost hearing those cheers by name and seeing familiar faces. 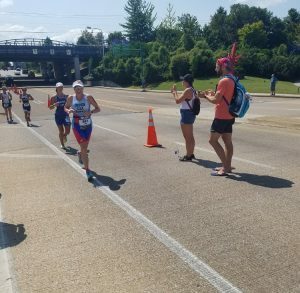 They made fun signs for me and I found myself looking for those bright signs every turn; it really kept me going and I can’t thank them enough for their support! 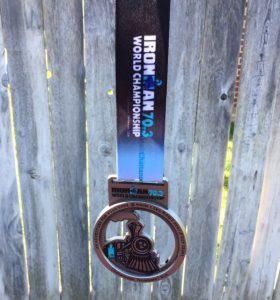 It was a long day and as I counted down the last 5K, I was delighted to know that I was going to finish an Ironman 70.3 World Championship that day. I did it! 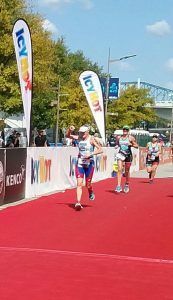 I made it to the finish with a smile on my face grateful that I am physically able to do hard things and push my body despite my physical struggles this year. I am truly so grateful for my friends, family and sponsor support from near and far. Those kind encouraging words I get throughout the year carry me through the hard workouts and tough challenging courses like this one. You are so appreciated! Thank you! Here’s to many more adventures together!